Who are Hawaiian Citizens and Hawaiian Subjects? Pauku 3. O na kanaka a pau i hanau malalo o ka malu o keia Aupuni, ina na na makua o ke Aupuni e, a ina na haole hoohiki i kanaka Hawaii, a ina na na kanaka maoli, a me ka poe i hanau ma ka aina e, ina no keia Aupuni na makua, a mahope hele mai na keiki e noho haanei, e manaoia kela poe a pau, he aie i ka hoolohe i ka Moi, ke alii ka lakou ma ka hanau ana, a e kau no ke kanawai o keia Aupuni maluna o lakou. o na kanaka a pau i hanau ma na aina e, ina no ka aina e na makua, a hoohiki ole hoi e like me ka olelo iloko o keia haawina alaila. e manaoia lakou he lahui e, a e hanaia’ku lakou e na’lii o keia Aupuni pela, e like nae me ka olelo o ke kanawai. Hawaiʻi followed the Anglo-American common law rule of “jus soli;” those born in the country and subject to its jurisdiction is a citizen. The common law rule traces back to the Norman Conquest of England in 1066. Subsequent interpretation of the laws and practices affirmed who were Hawaiian citizens and what rights and obligations they possessed. In 1856, the Kingdom’s Supreme Court decided Naone v. Thurston, recognizing that persons born in Hawaiʻi of foreign parents were Hawaiian subjects. The text and translation of documents here are from Ka Huli Ao Center for Excellence in Native Hawaiian Law, William S. Richardson School of Law. 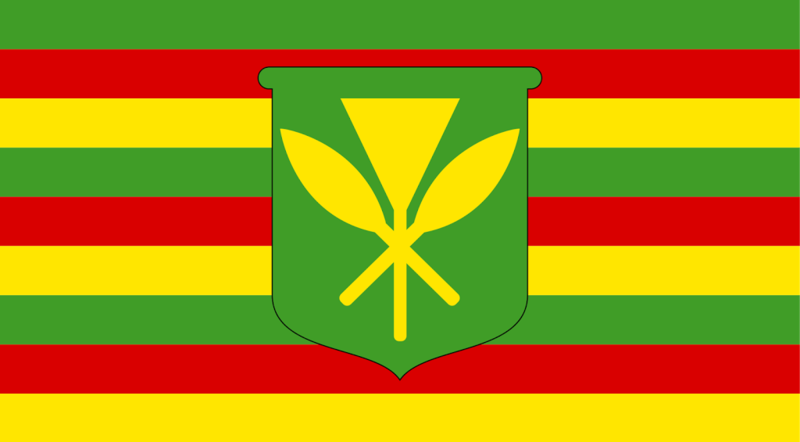 The image shows what is often described as the Kānaka Maoli flag and is used today as a symbol for Hawaiian sovereignty. I stumbled upon your blog today, and I couldn’t believe it. This is fantastic! The histories of the various places you write about is exactly the kind of thing I wonder about on a daily basis as I live and work on Oahu. Topics like how the waterfront of Honolulu Harbor has changed over the years are beyond fascinating to me and I look forward to pouring over all the old posts in your blog. Thanks and keep up the great work! !